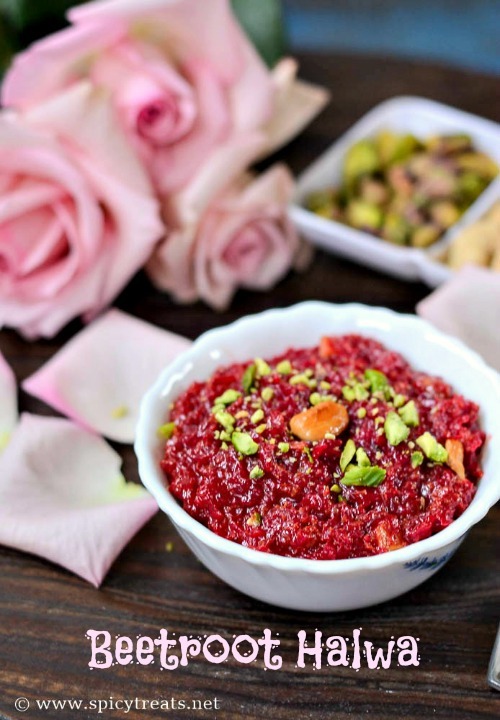 Again I am here with an easy, delicious and healthy sweet, Beetroot Halwa recipe to celebrate my blog baby's 6th Birthday, yes.,Spicy Treats turned 6 last weekend, I couldn't believe that Spicy Treats is six years old now, time flies fast. I started this blog on a Thai Pongal day, 2011 with Vazhaipoo Vadai recipe as my first post, I started it because I needed a diversion or to try something new which I love to control my depression. I knew I love cooking and even before starting blog I used to capture my cooking with mobile just to share with my mom & sis. Later, I used that mobile captures to post recipes in my blog under the title 'sangeethaskitchen'. With the warm welcome and encouragement from my dear friends and few co-bloggers really motivated me to continue my work in an even better way with good pictures and presentation. Then, gradually improved myself and moved from blogspot to own domain www.spicytreats.net in August 2012. Also, V gifted me Nikon DSLR camera the same year and then got new interest on food photography and still learning to present a recipe with simple and appetizing pictures. I take this moment to thank everyone who motivated, supported, helped me & my blog from the day one and till now, my first sincere thanks to my family especially Mr.V for all his support, motivation and sponsorship(for buying props ;) and every possible help he does for me & my blog. Without which I couldn't have come this far and next to my kids, because of them I have tried so many new recipes from out of my comfort zone especially baking recipes. My Mom was one of my greatest support and encouragement from day one I started this blog and now mainly for her I want to continue this blog to keep live of her recipes, and I wanted to reach 1000th recipe soon and more 1000s recipes here. My heartfelt thanks to all my dear friends, co-bloggers and each and every reader of my blog for your constant encouragement, love and support. Hope you continue the same in future also. 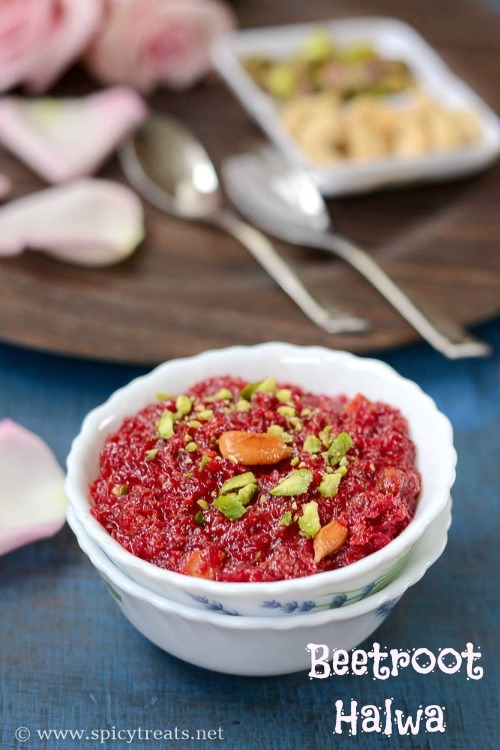 Now coming to the recipe, Beetroot Halwa is a simple and delicious sweet similar to Carrot Halwa. Beetroot Halwa is a milk based sweet, I like to use more milk and the condensation of milk with beets will lead to beetroot palkova, I never used khova but still my halwas tastes so rich and delicious. Only thing is it takes long time like Thirattipal/Paalkova. Definitely, its worth to enjoy this rich dessert. Sorry about the less clarity and quality step by step photos, it was a dull, gloomy rainy day and with kitchen lights I managed to take some step wise pictures. Because of flash and lights the color of the halwa is bit saturated more, if possible will update with better pictures sometime soon. First wash, peel and grate beets and keep aside. Boil milk and keep aside. In a non stick heavy bottom pan or kadai, add beets and stir fry for 5-7 minutes in medium heat(you can also use 1 tsp ghee to stir fry but I skipped ghee in this step). Then to it add milk stir well and cook it in medium heat until the beets is cooked soft and milk is reduced and thickened. Now and then stir the milk-beet mixture and mash the malai with it, if required you can also close the pan with lid and cook. Once the beets cooked and milk is reduced completely to the beetroot level add sugar and keep stirring for another 5-6 minutes. Once the sugar dissolved and the beetroot turns to halwa consistency add 1 tbsp ghee and stir well and cook for another 1-2 minutes. Meanwhile heat another tbsp ghee in a tempering pan and fry the cashew nut until turns golden brown and keep ready. Then add cardamom powder, ghee roasted cashew nuts stir well and switch off the stove. That's it...delicious Beetroot Halwa ready. Serve Warm or chilled. You can also use only 2 cups of milk but that halwa tastes different than this recipe. 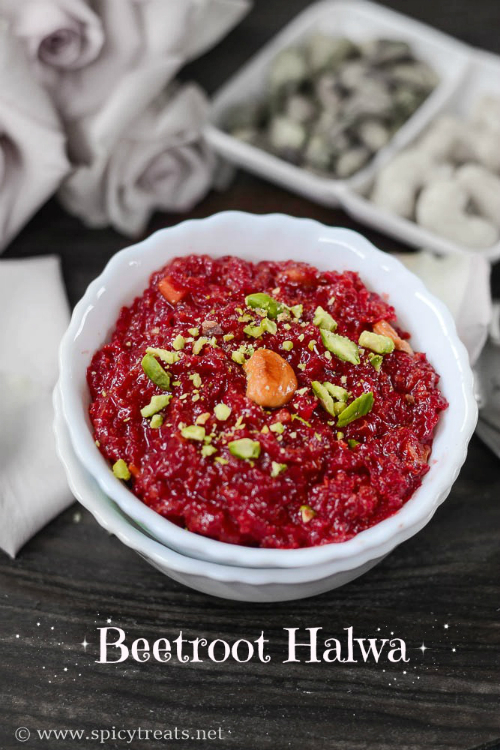 If you haven't tried beetroot halwa without khova just give this recipe a try and am sure you will love it. You can also use sweetened condensed milk/milkmaid instead of sugar but i haven't tried it so far. Halwa color depends on the beetroot, the quality of sugar and the amount of milk you use. Even with less ghee this halwa tastes great like Thirattipaal. Happy 6th blog birthday! :) I'm so lucky to enjoy your treats not just virtually but also in reality. Every item that I have tasted of yours have been out of the world. You really have some kind of magic and it's really sweet of you to share those precious recipes to the world. 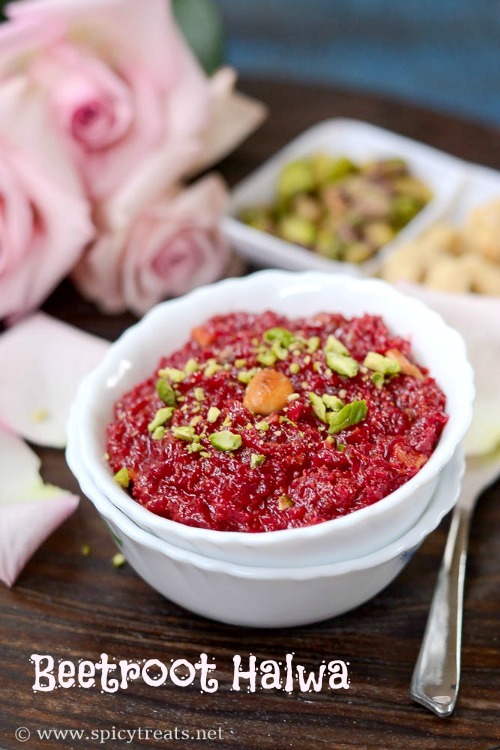 :) Beetroot halwa looks delicious, keep them coming!